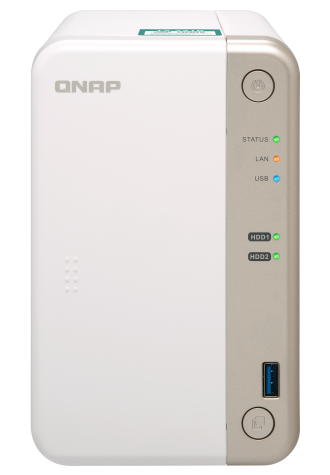 Adding an extra element of future proofing is always a good way of enhancing the appeal of a product, and that's exactly what Qnap is hoping to achieve with the TS-251B. 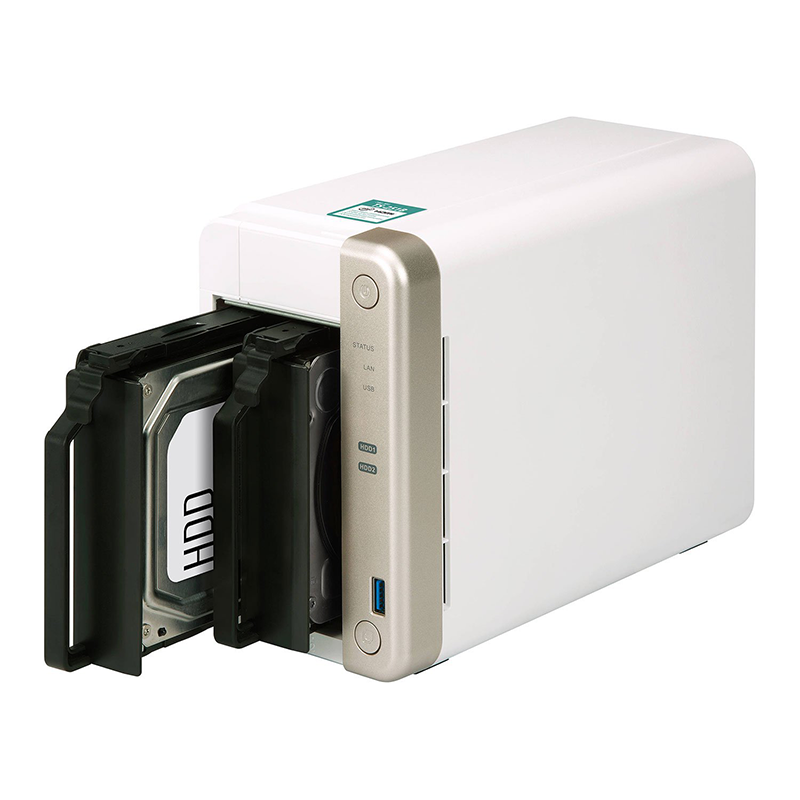 Priced from £300, this dual-bay NAS looks a lot like many other Qnap offerings aimed at the home or small office, but sets itself apart by including a PCIe slot that can be used to enhance functionality using one of various compatible expansion cards. Expansion slots on NAS solutions are hardly new, yet given that Qnap has a decent range of accessories in its portfolio, it is nice to see PCIe support being extended to more affordable units. At launch, two variants of the TS-251B will be available, a 2GB model priced at £300 and a 4GB model fetching £350. Having more memory can be useful if you're planning to explore more advanced features such as virtualisation, but savvy shoppers will note that it would be cheaper to buy the base model and manually upgrade the RAM. Designed to appeal to SOHO users, the TS-251B's two-tone chassis is easy on the eye and reasonably compact, measuring 168mm x 105mm x 226mm in size. The front of the unit is home to a power switch, five status LEDs, IR sensor, and a USB 3.0 port alongside a customary one-touch copy button. 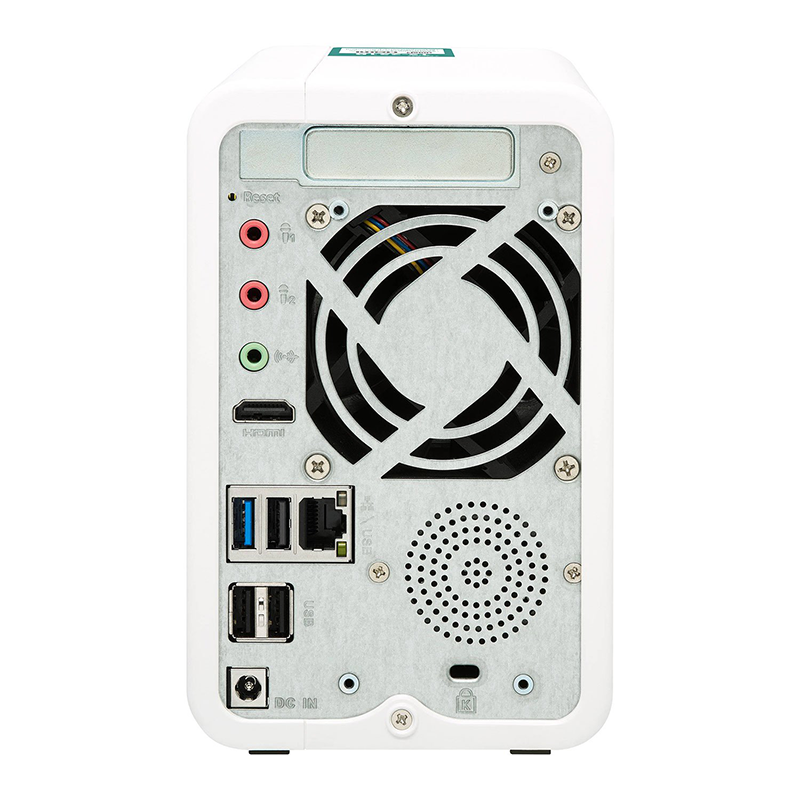 The bulk of connectivity is kept around back, where you'll find audio jacks, HDMI 1.4b, another USB 3.0, three USB 2.0, a single Gigabit Ethernet jack, a connector for the external 65W power supply, and a built-in speaker for computer-voiced status updates. A single 7cm fan keeps the unit cool, and the box is driven by a dual-core Intel Celeron J3355 processor with a maximum burst frequency of 2.5GHz and onboard Intel HD 500 graphics. Said chip ought to deliver solid performance while offering AES-NI hardware encryption and support for real-time transcoding of 4K H.264 media. For the most part, this is a fairly generic dual-bay solution. The front-facing, hot-swappable drive trays are easily accessed and are designed for tool-free installation of 3.5in disks (screws are only needed for 2.5in disks), but in comparison to other Qnap offerings, there's only one Ethernet jack and no IR remote control included in the box. 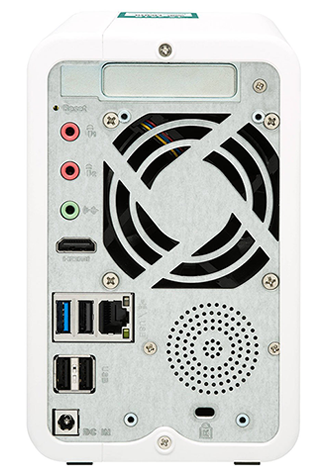 What helps the unit stand out is a PCIe 2.0 x2 expansion slot that is reached by removing the top cover and able to accept a wide range of optional accessories. Want to add a couple of USB 3.1 Gen 2 ports? The £60 USB-U31A2P01 expansion card will do it. 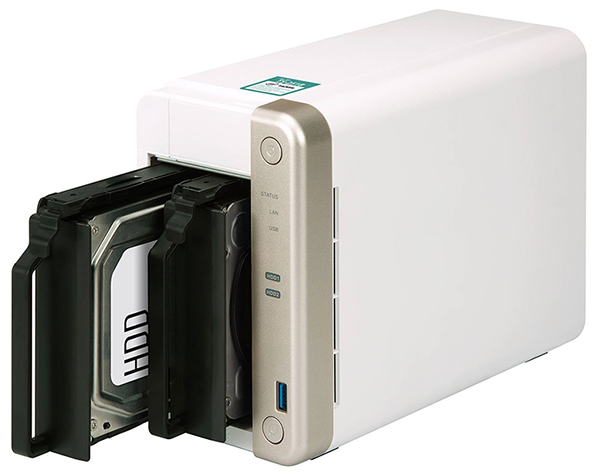 How about a pair of high-speed M.2 storage bays? The £100 QM2-2S-220A SSD adapter ought to do the trick, and if your network is ready to make the jump to 10GbE, there's the LAN-10G1TA, available for £125. It is helpful being able to keep one eye on future developments, however there is a catch in that the TS-251B's PCIe 2.0 x2 expansion slot is limited to a theoretical throughput of 1GB/s. That's a limitation of the underlying Intel Celeron platform, and though most usage scenarios won't feel the bottleneck, high-speed networking is starting to come of age and the expansion opportunities on offer here aren't quite as forward-looking as we'd hoped. Opt for the £210 QM2-2S10G1T, which includes two M.2 slots as well as a 10GbE port, and you'll not be able to run everything at full speed. Keen to extol the virtues of the TS-251B PCIe slot, Qnap equipped our 2GB review sample with yet another expansion option in the form of the £130 QWA-AC2600 wireless adapter. Simple to setup, this particular expansion card comes equipped with two Qualcomm QCA9984 NICs, allowing for dual-band AC WiFi at speeds of up to 2,533Mbps with support for 4x4 MU-MIMO. 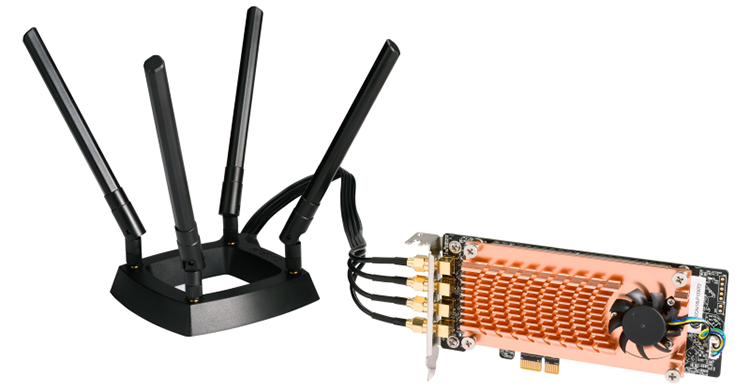 Configured via the WirelessAP Station app, the WiFi adapter can be used to provide direct wireless access to the NAS from multiple devices, or can be deployed as a dual-band access point for extending the reach of WiFi in your home or office. Both functions work as expected, yet there are question marks surrounding the real-world benefits. We're of the opinion a NAS is best hard-wired to the network, but we're curious to hear user opinions; is there a scenario in which the QWA-AC2600 could prove useful to you, and is it something you'd genuinely consider? Answers on a post card, but do note that the adapter is only compatible with certain Qnap NAS units or Ubuntu/Linux PCs - Windows drivers for the Qualcomm NICs don't (yet) exist. 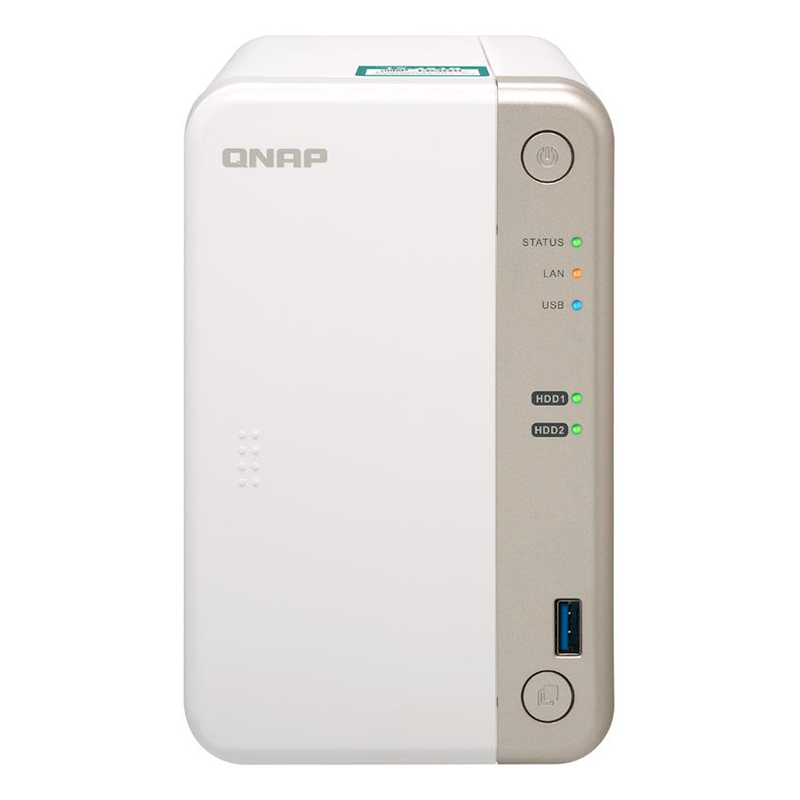 Adding advanced wireless functionality may seem a niche solution, yet there's no denying that Qnap's NAS ecosystem has grown to incorporate features that few other providers can match. 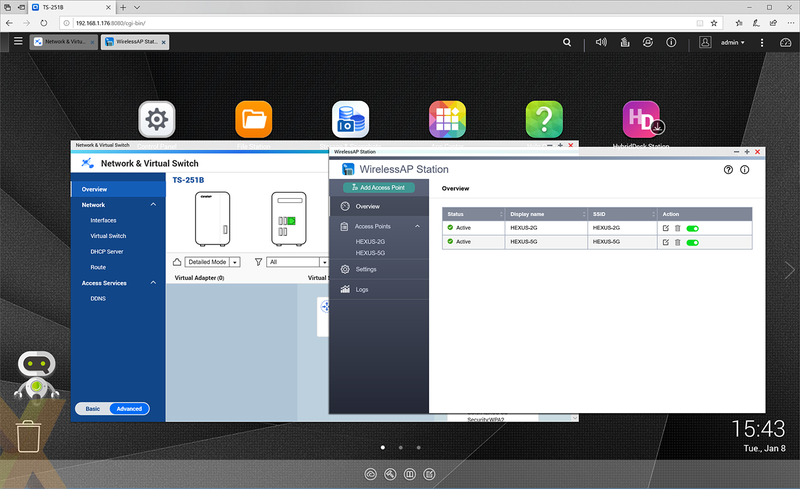 The firm's QTS operating system is among the best in the business, though arguably a tad more cluttered than Synology's rival DiskStation, and if you prefer not to attempt building your own server, few turnkey solutions are as comprehensive as the Qnap. Centralised storage, multi-device backups and media servers are merely scratching the surface of what the TS-251B can do. Head over to the official product page if you need a full list of hardware and software features, and then move on over to the next page to see how the 2GB unit fares in our benchmarks.